This is exactly how I found it. In other words this gem was delivered in the most direct and gentle way possible. Straight to a PO box. No long, winding, potholed rural route. No exposure to the "wind, rain & snow." Simply from the USPS direct to my box. There's no need to dwell on the irony of this piece requesting that I share feedback on how to improve the "business delivery experience." 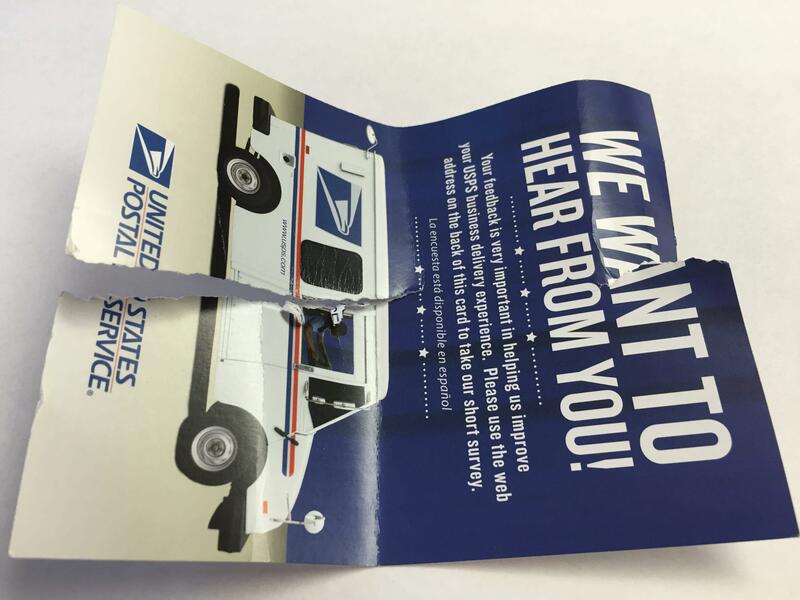 And although this piece solicited delivery feedback, it could have been one of the countless pieces I receive regularly from the USPS encouraging me to consider direct mail advertising. Normally, as an inbound marketing consultant, I discount the claims of impact and effectiveness. But this time I'd agree, the impact is notable. Last week I shared a story of the "google ad guy" cold calling me, in person, in my quiet hidden office. Then just a couple days later I received this direct mail piece. The folly of both seems clear. But many companies, particularly in the industrial manufacturing B2B Sales space seem to cling to these methods. They bring to mind a recent conversation with a large industrial trade publisher/show management firm. In discussing digital marketing the editor in chief said "Our readers don't spend hours on the internet. That's why they prefer our magazine." Putting aside the question of causation vs. correlation, I completely understand the premise that they may leaf through the magazine to catch up on trends and news (although I'm sure that's not for hours either.) But I'm also certain that when they get ready to solve a problem or find a solution, they don't start flipping through back issues like a kid in the 70s looking for National Geographic photos to include in a term paper. Instead they turn to the internet to find answers and solutions. I've got two views as an inbound marketing consultant. First is that the content marketing space is getting very crowded very quickly. There are so many agencies jumping in and companies experimenting that it seems it's nearly mature. Second, though, is that the actual number of companies executing consistently is pretty low - and the number prepared to elevate their effort to the higher level of MANUFACTURING JOURNALISM™ is pretty small. If you're a manufacturer, here's my advice. Don't get hung up on marketing, SEO, inbound marketing, content marketing, internet marketing or any other buzzword. Then start from there. More later this week on finding the right people to help - and vapid, meaningless statistics to avoid! In the meantime, download our free eBook on Manufacturing Revenue Growth for Manufacturers for a straightforward, actionable framework to achieve those goals.